You can sleep up to 6 people in this one of a kind waterfront home. Can't get any closer to the water than this! Designed to maximize your views and furnished for your ultimate comfort. Romantic & cozy yet plenty of room. Watch the sun rise and set, and the constantly changing kaleidoscope of water, mountains and sky right in front of you. Within walking distance is a playground, basketball court and a beautiful half moon beach. Hiking trails, beaches, bird sanctuary, a lake, and a historic lighthouse are minutes away. Food, gas, groceries and a casino are 10-15 minutes away. White Horse golf club is nearby as is CB's Nuts, Hood Canal Brewery and Downpour Brewing. Costco and Home Depot are half an hour away. The kitchen is well stocked with a gas stove & oven, Keurig style coffee maker, crockpot, rice cooker, waffle maker and toaster oven. Sit on the deck on a comfy chair with a throw blanket and enjoy the view. At night-so many stars! You will feel relaxed and rejuvenated after just a few days. Longtime NW residents-love sharing our place with you! One of a kind with 180 views of water & mountains. You get sunrise and sun set views from the huge wraparound deck. White Horse Golf Club is 20 minutes away. The location of this property is fantastic. 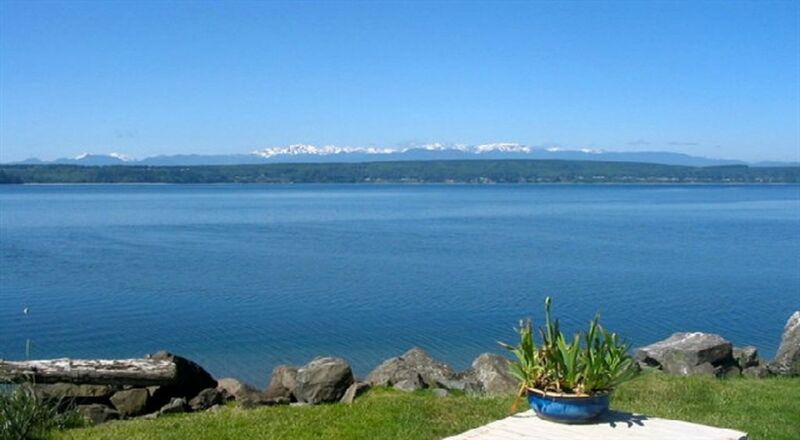 Right on the Hood Canal with to die for views of the Olympics! Great for birders. Lots of other wildlife, too. Geoduck fisherman to watch and submarines going through the bridge. The house was comfortable enough for six weeks for two persons and a pet. The linen closet and kitchen are well supplied. Communication with the hosts was a pleasant breeze. They are occasionally on site to pick up your trash and work on the garage ADU. Something to note for extended stays is to not forward mail here. Use UPS or Fedex only. The local post office has friendly employees but it’s a bit of a comedy of errors. Some fresh paint and carpet and this property is five stars! Thanks Daryl and Scott.